The Middle East’s biggest slide and dance party ‘Aquaventure After Dark’ returns to the Aquaventure Waterpark at Atlantis, The Palm in Dubai this month for a spooktacular special ‘Haunted Edition’ fuelled by Coca-Cola. Taking place on October 26, the event offers party-goers a fun-drenched evening from 8pm to 12am midnight. Featuring pumping music zones and stacks of inflatable fun, Atlantis Aquaventure Waterpark will offer visitors the chance to take on 20 of the region’s craziest waterslides, made all the more exhilarating by night and some spooky additions. 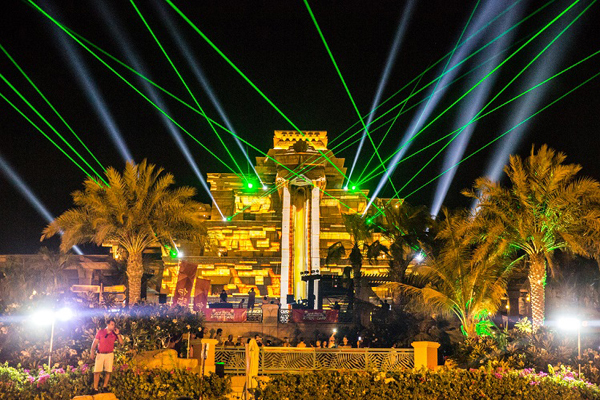 Guests aged 15 and above can expect crazy laser and fire shows, an unmatched atmosphere, and the chance to wade through the haunted towers. New to the event will also be an exclusive girls-only Havainas Chillax Zone. The recommended age for the Aquaventure After Dark event is 15 years+ and all guests aged 14 and below must be accompanied by an adult aged 21+. To save 25 per cent on admission, limited advance purchase tickets are available for only Dh149 ($40.5) on the park's website or by calling the hotel. Tickets will be Dh199 ($54.1) thereafter. Tickets only available online. No tickets available at the gate on the day.